Umi Sushi is the coolest thing to happen to Shelter Island since Miles Davis played Humphrey's in 1986. Opened in September, Umi's been playing to growing numbers of fans, with four first-rate sushi chefs, a cadre of delightful servers with a watchful style. The name means “ocean” in Japanese, and indeed, the seafood here tastes freshly pulled from the deep. 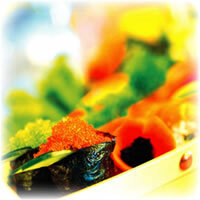 Umi Sushi, 2806 Shelter Island Dr., Point Loma (619-226-1135). Open for lunch Mon.-Sat., 11:30 a.m.-2:30 p.m.; dinner Mon.-Sun., 4:30 p.m.- 9:30 p.m. ($4.50- $17.95). 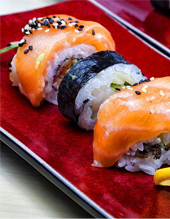 For the highest quality, quantity and presentation look no further than Umi Sushi. 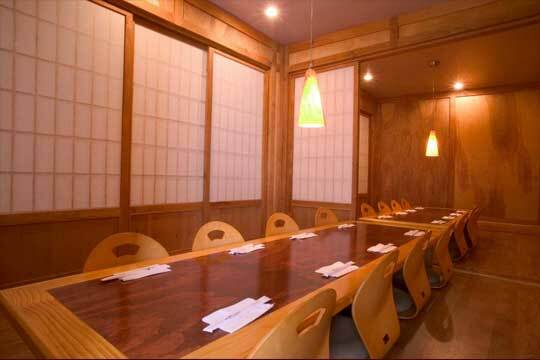 Their 20-seat sushi bar is filled with happy diners enjoying the best sushi in town. The sushi is as delicious as it is eye-catching. For a roll with a twist, try the Crazy Boy. It's crab and avocado cut length wise and rolled in tempura. It's delicious! Definitely have the mountain roll, which is spicy tuna topped with baked salmon and sweet sauce. They also have sashimi and teppanyaki as well as plenty of non-sushi dishes to choose from including their popular barbecued short ribs. For an unbeatable experience for parties of six or more, dine in their tatami rooms, which are private rooms where you sit on cushions on the floor. It's intimate and fun. With all these accolades going for it, Umi Sushi will definitely become one of your favorite places to dine. Banquets. Catering. Food to go, Japanese beer, wine and sake. Credit cards: American Express, Diner’s Club, Discover, Master, VISA. James Park finds himself in an envious position. As owner of a couple of very successful award winning Takamatsu restaurants in Phoenix and Tucson, he's now also operating his third venture, Umi, on Shelter Island, with a celebrity partner, Boston Red Sox ace reliever Byung "BK" Kim. It was during his earlier stint with the Arizona Diamondbacks that James and Byung hooked up. They bought Umi and redecorated it and created a fantastic new menu. The sport connection is depicted in the restaurant with framed jerseys and other decor such as pretty paper lanterns, aquariums, pretty woodwork and a large mystical "fish dragon." There are a couple of sushi bars, one seats 12, another about 20; and there's plenty of room in the adjoining dining rooms. You won't strike out at Umi; virtually every item we tasted was superb. Clip today's coupon and get ready to enjoy a terrific meal. The appetizer and sushi roll is unique in that almost every item is illustrated with a clear full color photo. 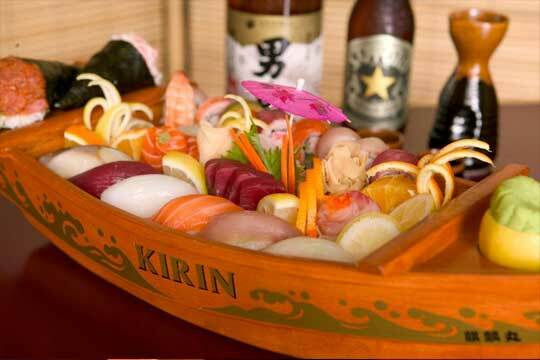 Among appetizers, try the incredible soft shell crab, the seafood salad, Gyoza dumplings, baked green lip mussels, Yakitori skewers or the tuna sashimi. The array of specialty rolls in truly amazing. Try their Crazy Boy Roll (a delicious squared roll of crab and avocado wrapped in a tempura baked golden brown). The No.21 is a thing of beauty called the Caterpillar Roll (it really looks like a green caterpillar made with thin sliced avocado, eel and cucumber, complete with two salmon eggs for eyes, almost too pretty to eat). Other great rolls are the Vegas Roll (crab, salmon tempura, avocado and cucumber), spicy Scallop roll, Spider Roll with soft shell crab, or the Mountain roll with spicy tuba. In all there are some 35 rolls to choose from. 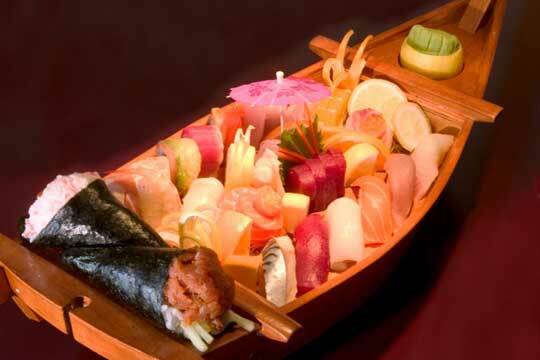 There's also a complete list of traditional Nigiri sushi classics, combination boats and plates and sashimi. Umi also has some tasty japanese dishes including beef Katsu, chicken teriyaki, barbecued short ribs, beef teriyaki and noodle specialties. Those craving a variety of items are advised to enjoy a two or three item reate your own combo. An example of one would be a three-item combo of a California roll with mixed tempura and chicken teriyaki, served with rice and miso soup for only $17.95. A two-item combo is just $15.95. For dessert, try the novelty called Mojji ice cream (nuggets of ice cream wrapped in flavored marshmallow like confection). Party platters are a specialty (great for football parties). Umi (open for lunch and dinner) is at 2806 Shelter Island Dr. Call (619) 226- 1135.